Florence Viscountess Downe, later Mrs. Arthur Maxwell Bury, née Florence Faith Dening (d. 1958). Sitter: Florence Viscountess Downe, later Mrs. Arthur Maxwell Bury, n�e Florence Faith Dening (d. 1958). Biog: Daughter of Rev. Thomas Henry Dening; m.1stly, as his 2nd wife, Hugh Richard Dawnay, 8th Viscount Downe (1844-1924); m.2ndly (1931) Rev. Arthur Maxwell Bury (d. 1936). 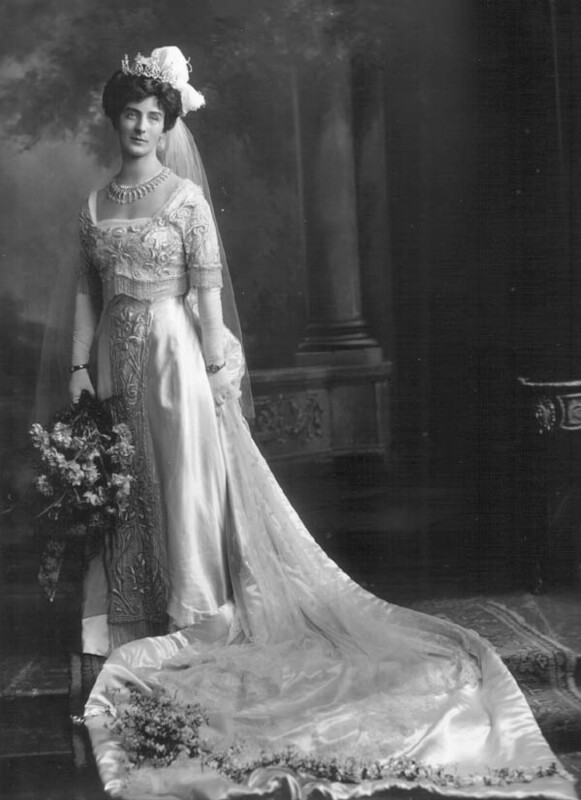 Occasion: The Court, 14 May 1912: presented by the Duchess of Devonshire. Furniture & Props: Painted backdrop; side-table. Occasion: The Times, 16 May 1912, p 10c. Reproduced: (version) The Ladies' Field, 25 May 1912, p 537.